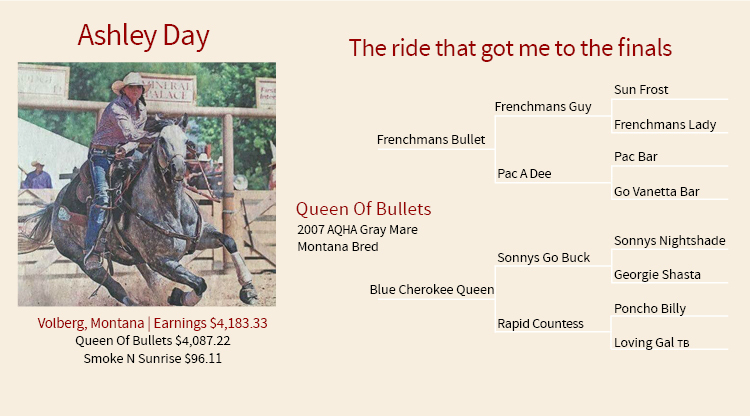 I plan to ride my 10 yr old gray mare, Queen of Bullets, who I call Easy Abutting. The Futurities were my main focus for 2017, so I feel blessed to get the opportunity to get go to the MT Circuit Finals! WPRA Highlights were placing in the top 3 in Killdeer and Wolf Point, but her biggest one was taking care of Kyler (my 9 yr old son) at the Broadus Youth Rodeo, she took him around them and they won the Barrel Racing. What is your horse(s)' style when running barrels? She loves indoor pens! She’s not a large horse and she is always looking for a barrel to turn, so she excels inside. What special qualities does your horse have and what makes him/her unique? She is funny because she loves her job and always tries her hardest but after she’s done she prefers to be fed and doesn’t want to be doted on. She likes her space! I ride a lot of colts, so I spend a large portion of my time with them... Easy gets exercised regularly and I hardly ever work her on barrels. I mainly just make sure she’s feeling 100%. I love that it is a sport we can do as a family and I also truly appreciate the friendships made through the years. The sport is filled with great people.